How many cups of coffee do you make at once? In the average household, it’s usually no more than 2 mugs’ worth of coffee–enough for Mom and Dad to take to work. Converting that into coffee maker sizes, that’s 4 cups of coffee! If you are looking for the best 4 cup coffee maker, here you go! A 4-cup coffee maker is a perfect size for a family with only two coffee drinkers. It delivers freshly brewed coffee in just the right quantity, enough to fill two large mugs or travel cups. You never have to worry about wasting coffee, as the coffee maker will only make exactly as much as you need. And bonus, the brewing process usually doesn’t take as long as the typical, larger drip coffee makers, so you can get your brew much faster too! Now comes the hard part: choosing the right coffee maker! With so many amazing options online and in local stores to consider, how could you possibly find that one coffee maker that suits you best? 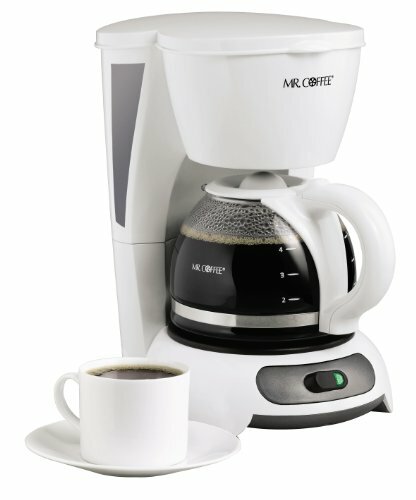 If you’re looking for a user-friendly coffee maker that delivers two quality mugs of coffee every time, you’ll want to go with this Mr. Coffee coffee maker. It’s built to make it easy for you to brew coffee just the way YOU want it! It’s as simple as pouring water into the reservoir, filling up the filter basket, and pressing the “on” button to get the machine percolating. 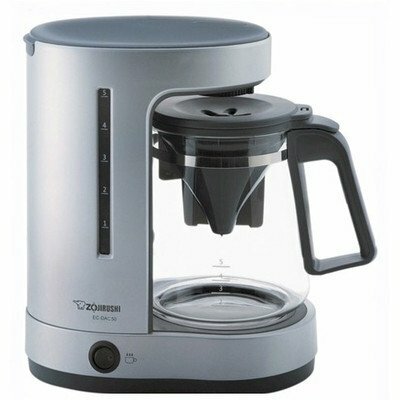 If you want to serve yourself while the coffee is brewing, the coffee maker is designed for “pause & serve“. The indicator light will let you know if the machine is on or off. You can leave it on to keep the coffee warm in the pot or turn it off to reduce electricity usage. The machine is also wonderfully easy to clean! The reservoir stays clean through hundreds of uses, and the plastic shell of the coffee machine is simple to wipe down and keep stain-free. The steel warming plate is also stain-resistant, so you won’t have to worry about drips or spills. You can simply remove the filter basket, empty it, rinse, and replace-easy and time-efficient. It’s a no-nonsense coffee maker. It may not have the bells and whistles of fancier coffee makers, but it’s simple, easy to use, and produces a great cup of coffee every time. Any coffee drinker would agree. It’s cheap. You pay just $20 for this coffee maker! It’s user-friendly. It takes all of five minutes to set up and get coffee brewing, and there is no learning curve with the coffee maker. It can sit easily on your kitchen counter! This little guy doesn’t take up as much room as your fancy drip coffee maker, so even students can find room for this one! There are no frills in this model. You can’t warm milk or make espressos. It’s a machine designed for just one thing! It’s not automated. You can’t set the machine to make coffee at a certain time every morning, but you have to set it up yourself and press the “on” button to get it working. It’s not a programmable coffee maker, but for the price, that’s expected. Still, at the $20 price tag (as of this writing – check here for latest), you can’t complain! It’s a simple, easy, and wonderful 4 cup coffee machine that gets the job done every time. It’s reliable! Like all Black and Decker appliances, it’s easy to use and very convenient. The auto shut-off feature ensures your coffee maker uses as little energy as possible, and it will keep the machine working well for years to come. It comes with a travel mug! The personal coffee maker is designed to not only make 4 cups of coffee, but it can brew directly into the included travel mug. You can get your coffee ready to go to work instantly thanks to the design of this coffee maker. The stainless steel mug is well-designed and fits most car cup holders, and it will keep your coffee warm. Even if you don’t use the travel mug, you can still get two normal-sized cups of coffee per brew. The built-in filter eliminates the need to use paper filters, and all you need to do to keep it clean is lift out the filter, rinse, and replace. It’s a no-fuss coffee machine that produces great coffee with every use. Brews quickly–about 2 minutes of percolation, and you’ve got a cup of coffee! Easy to keep clean, and reduces filter waste. Compact, takes up minimal counter space and can be used with multiple cups. If the spout isn’t lined up just right with the hole of the travel mug, it can make a mess. You can’t use coffee that is ground “too fine“, else you will get coffee ground inside the machine itself. So keep the coffee beans ground at a medium level and you’ll be good to go! 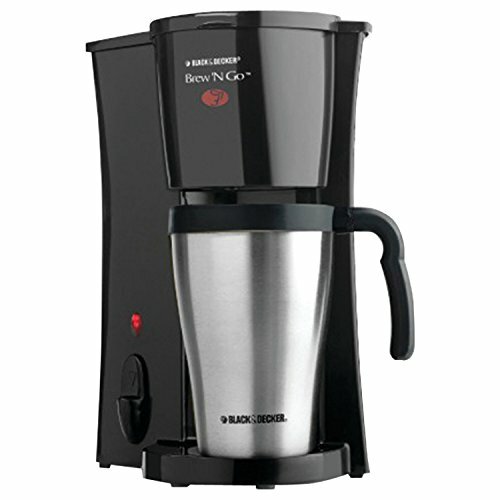 At a comparable price to the Mr. Coffee (check here for details), this is yet another well-priced coffee maker! This is actually a 5 cup coffee maker, but it works best when you use it to make just 4 cups. It’s a top-quality machine built with the reliability of Japanese appliances, with the low-power usage that will help you to conserve energy and reduce your carbon footprint. What makes this coffee maker unique is that the filter isn’t actually built into the machine–it’s built into the carafe! The filter cone sits inside the glass carafe, and the water simply drips from the machine into the cone to brew the coffee. 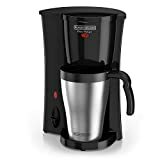 It makes the brew much tastier and more concentrated and makes the coffee maker itself more compact. The water reservoir can be removed for easy rinsing (to eliminate sediment or calcification over time). You’ll love the auto-warming feature, which will stay on to keep the coffee warm until the carafe is mostly empty. With is charcoal water purifier, you get cleaner, tastiest water with every brew. It’s compact and takes up very little space on the kitchen counter. It’s about 60% of the size of most regular 4-cup coffee makers–perfect for those with limited kitchen space. It brews a delicious cup of coffee. Reviewers agree that few 4-cup drip coffee makers can compare with this one! In my tests, I definitely noticed a difference as well. It’s easy to keep clean. Thanks to the removable water reservoir and the filter built into the carafe, it takes just a few minutes to clean the coffee machine inside and out. It’s pricey. More so than the others. Check this listing for the live pricing. is a lot to pay for a simple 4- or 5-cup coffee machine. Compare that to the $20 price tag on the other machines, and you can understand why it’s not our top pick. It tends to drip. If you don’t place the carafe in precisely the right place, the water may drip onto the lid instead of into the filter. Trying to brew coffee in a hurry may lead to a mess. If your goal is above average coffee and you don’t mind paying a bit more, this is the coffee maker for you. It delivers every time, and it is built with all the creative ingenuity to make it a unique, highly reliable appliance. Can the filter apparatus be removed from the carafe for cleaning both the carafe and the filter basket?